After a short hayride through the fields of Cobram Estate, we turned into a lane and saw olive tree after olive tree, just like this one. Some had already been pressed just a day before our arrival, of which I had the chance to sample with my own gluten-free bread I baked before attending the Cobram Estate olive oil excursion with the IFBC 2017 in Sacramento. Photo taken by Imei Hsu. Disclaimer: Cobram Estate and Boundary Bend did not pay me to write a review about their olive oil or production press. In exchange for a discounted price on conference attendance, I have agreed to write three posts about any aspect of the conference, and this post is the second of three. Cobram Estate gifted each excursion member a bag containing a bottle of first-press extra virgin olive oil. I wrinkled my nose. I immediately disliked it. The fresh greens, tossed with olive oil and vinegar, held a fetid odor, and the thick liquid caught in my throat and ejected itself into the air with few uncontrolled coughs. We sat in the chain restaurant of the day, plastic menus collected and bread baskets with salad on the table. As a person of Chinese descent, I grew up eating most of my cooked vegetables stir-fried with a cheap oil, so I expected a light salad with the heart-healthy darling of the food world, olive oil, to be a rich and enlightening experience. Yet as a young adult in the early 1990’s, I had much to learn about American cuisine, and I knew even less about Mediterranean food. As I continued to gag, I couldn’t understand what the big deal about olive oil was all about. Nearly thirty years later, I’ve come to realize that I probably had tasted rancid olive oil, oil that had either sat out in an container for hours on end, and quite possibly lived inside of an opaque or dark glass container far longer than its shelf life. In other words, the olive oil was rotten. And everyone was eating it on their salads, dipping their bread into it, and pouring it over their foods, pursuing its known anti-inflammatory benefits, yet saying not a single word about how incredibly awful it tasted directly on the tongue. Why? The answer to this can be found when you taste good olive oil and understand why part of the olive oil industry are working hard to protect high quality oil, while others simply want to exploit it. Chef O’Connor prepares a full spread of delicious foods made with olive oil from Cobram Estate. Photo taken by Imei Hsu. After a recent visit to Cobram Estate in Woodland, CA, and the olive press and production company Boundary Bend, I know why no one at my table said anything that day in the restaurant. Many of us do not know what freshly pressed olive oil should taste like; our palates have been groomed over the years to ignore the rotten flavor of old or inferior quality olive oil, to the point that a fresh, high-quality olive oil might be nothing short of a wildly sod-like surprise. I climbed onto a bale of hay on the back of a flatbed truck along with other IFBC attendees, and we smiled into the afternoon sunshine, admiring the view. Row after row of almonds trees and young olive trees lined the view on either side of the dirt road. As soon as we turned into the main part of the olive groves near-ready for harvest, I took in the sight I had been looking forward to. Branches heavy with green leaves with and ripened fruit filled the air with that familiar smell of the classic kitchen; in fact, when I closed my eyes, I could imagine myself standing in a kitchen somewhere in Morocco, Israel, or the South of France. Polyphenols. Polyphenols are known for their anti-inflammatory properties,, their uses in helping to reduce weight gain, and in fighting cancer and the effects of aging. You will not go into a natural pharmacy without running into products that contain polyphenols. Oleocanthal levels. Admittedly, I know the least about this component of olive oil. What I do know is that higher oleocanthal levels have been researched for it anti-inflammatory effects, which have been compared to Ibuprofen. Extra virgin olive oil (EVOO) is particularly known for high oleocanthal levels; in fact, Oleocanthal is unique to olive oil and isn’t found in other foods. Fatty acid profile. I likely do not need to sell you on the benefits of including fatty acids in your diet. If you follow a no or low-processed food profile, you have to be very intentional about replacing fatty acids, particularly if you are vegan, vegetarian, or mostly avoid animal fats. The olive oil’s fatty acid profile is well balanced and suitable for vegans and omnivores alike. While we’re talking about oils, I commonly get asked what oils to avoid. Like the people behind Autoimmune Wellness, I too avoid the cheap seed oils (I’m food intolerant and reactive to them anyway) such as safflower, sunflower, canola, and nut oils. 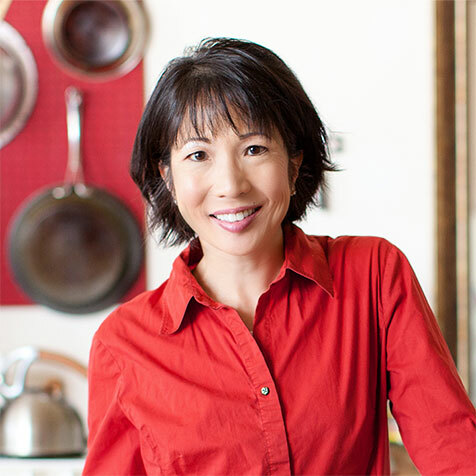 For cooking, I use animal fat or coconut oil, which is what is typically recommended for people like me who have an autoimmune disease. The other oils are ubiquitously used throughout the restaurant and commercially-processed food industries, which is another reason why it is so important to learn how to prepare and cook your own food, as opposed to relying on someone else to make those choices for you. With olive oil, it’s best that you serve it at room temperature and never use it for cooking at high heat. You are likely going to come across popular Internet articles saying the opposite. I personally don’t place a lot of high trust in those articles, as they aren’t written to meet a health industry standard. Everything I have come across has made it clear that you do not cook at high heat with olive oil. Period. This has to do with the chemical bonds in this monounsaturated oil, which will be broken at higher heats, such as when you sear meats or saute vegetables. Instead, consider drizzling olive oil on food that has already been cooked and is still warm, or tossing onto a salad. An interesting story was shared with us during the Cobram Estate excursion. Bob and Paul, the founders of Cobram Estate, used to grow other crops and livestock on their farm. However, they almost lost the farm, literally, in those earlier days. Finally, when they decided to grow olive oil, they noticed that olives not only grew well (they knew it would), but that it was popular to grow, right up there with almonds. There is a market for quality olive oil, and people will pay for quality if they can recognize it. At the end of the day, olive oil is still the heart-healthy oil that researchers have believed it to be. And that is both a boon for the olive oil industry, and a point that has been unfortunately exploited for dishonest gain. What If The Consumer Can’t Tell The Difference? 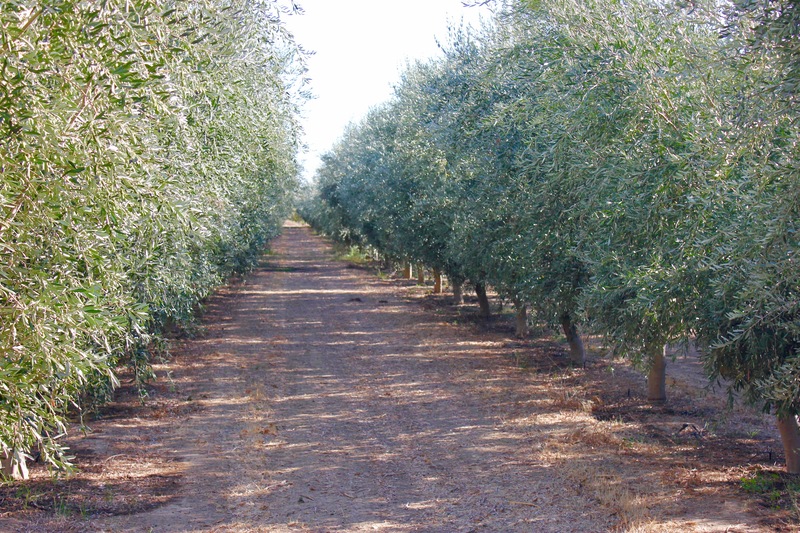 Cobram Estate joined the Olive Oil Commission of California (OOCC), and I can tell by the pride in their voices that this is a big deal to them, as well as an important protection for olive oil consumers. As a member of the OOCC, olive oil handlers like Cobram Estate who produce 5,000 gallons or more are required by law to participate in a mandatory government sampling and testing program; handlers who produce less than that threshold may volunteer to participate. Now, going back to my story, you can see why this is an important label. How do you know if you are getting a quality product? Do you just buy the most expensive brand available, and hope for the best? Or do you buy the cheapest olive oil that says, “Extra Virgin Olive Oil” and look for a picture of something that looks, well, mediterranean inspired? Well, apparently, this isn’t a question lost on those who wished to exploit the market and uneducated consumers looking for the health benefits of olive oil. In an expose in the New York Times in late 2015, the restaurant world buzzed about how as much as 80% of the so-called extra virgin olive oil sold in the U.S. was “fake” oil: either olive oil mixed with other oils, or poor quality olive oil that should have never been labeled extra virgin olive oil in the first place. If you are a person trying to use food as medicine, this is indeed a big deal. It’s on par with being told that all your medicine has been replaced with lesser quality ingredients or possibly ingredients that may make you ill. You would want the company to disclose any information about ingredients and processing. Cobram Estate olives are processed at Boundary Bend, where we ended up in the evening to see the production and press area. Boundary Bend is still listed by the OOCC in good standing, and therefore the olive oil retains the EVOO label. It starts with an olive. Does it stay or does it go? A scanner looks for imperfect olives and shifts those out of the hopper, so only the good ones make it through. Picture taken by Imei Hsu. Therefore, even if someone doesn’t have the education to know the difference by taste of a lesser quality EVOO, the label can help consumers know they are getting a quality product that is worth their dollars, instead of an inferior one that may be more expensive but comes with fancy packaging and an equally fancy price tag. 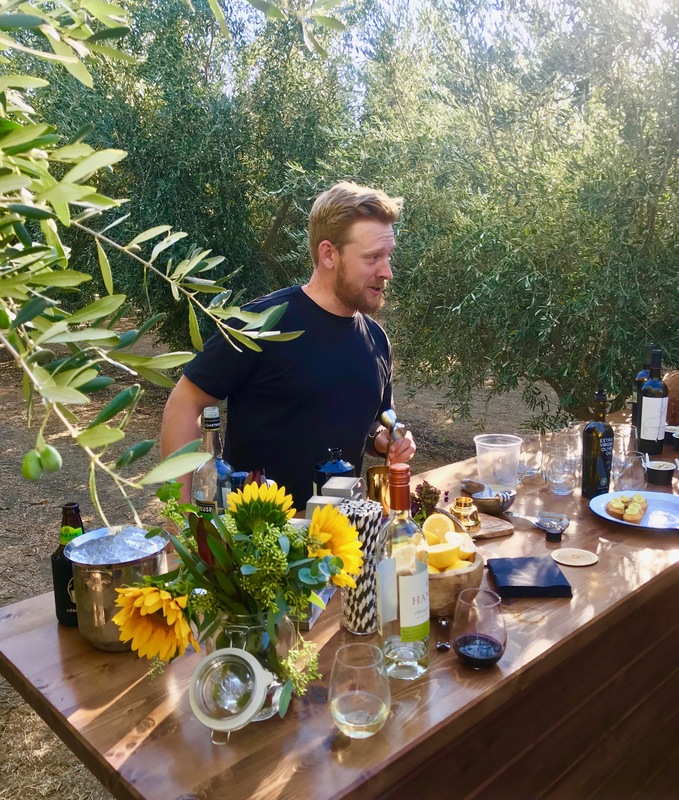 Based on my experience in the Boundary Bend tasting room, it takes times for people to learn about all the subtle differences in flavor that makes an EVOO a quality one, and much like wine tasting, comes with time and practice. Therefore, the ability to using testing to determine which products can use the California Extra Virgin label is an important consumer protection. You can expect that a quality EVOO will be priced in the US around $15 per liter. This is fairly consistent with what I am seeing at the markets I shop at in the Greater Seattle Area. In specialty shops touting imported products, those prices may be higher. When you see a product listed as an EVOO but at much lower price, you might want to look for any kind of certification label that might help you determine if that product is truly a high quality EVOO. Cobram Estate was also named “Healthiest Olive Oil in the World” at the Heath and Food EVOO Awards Competition at Malaga Costa Del Sol, Spain in May 2017. Cobram competed against olive oils in Spain, Italy, and Greece, and still won. When the US imports 95% of its olive oil, with 50% of the world’s olive oil coming from Spain, it’s even more impressive to see how Cobram’s olive oil stands against a highly competitive field. Again, even if you can’t tell by taste just yet (i.e. we gotta get your taste buds accustomed to what cold pressed, fresh olive oil tastes like), the label can steer you in the right direction. Remember those old-fashioned blind taste tests conducted in grocery stores? Pepsi vs. Coke? Or in wine stores, a cheap $10 wine versus a $100 wine? (Remind me to tell you about the time I got a vendor to buy me an $800 bottle of wine on a wager involving blind wine tasting. And no, there was no hanky panky or anything inappropriate involved. Honor bright, snake bite). You need to do this with olive oil. Just pour a teaspoon of olive oil in a shot glass and toss it back. 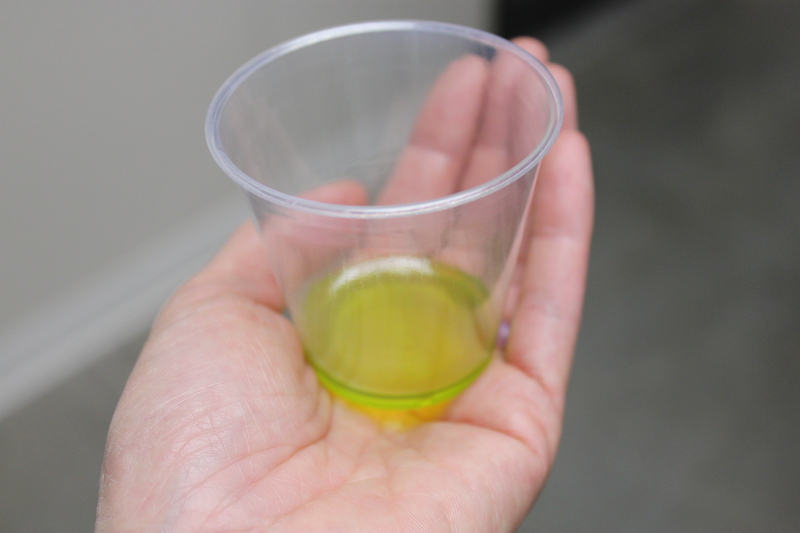 So — what should a cold pressed, fresh olive oil (to the press within six hours of picking) taste like? Can you drink olive oil straight? Yes, if it’s cold pressed and fresh. Photo taken on an iPhone 7 Plus. According to Boundary Bend, a cold pressed, fresh olive oil should taste almost “grassy”. There is a little sting to it in the back of your throat, (that’s that anti-inflammatory component mentioned earlier), yet it is a different sensation than what you get when you swallow liquor. I wouldn’t describe it as a burning sensation. It’s more like a light biting sensation, as when you swallow something containing black pepper. 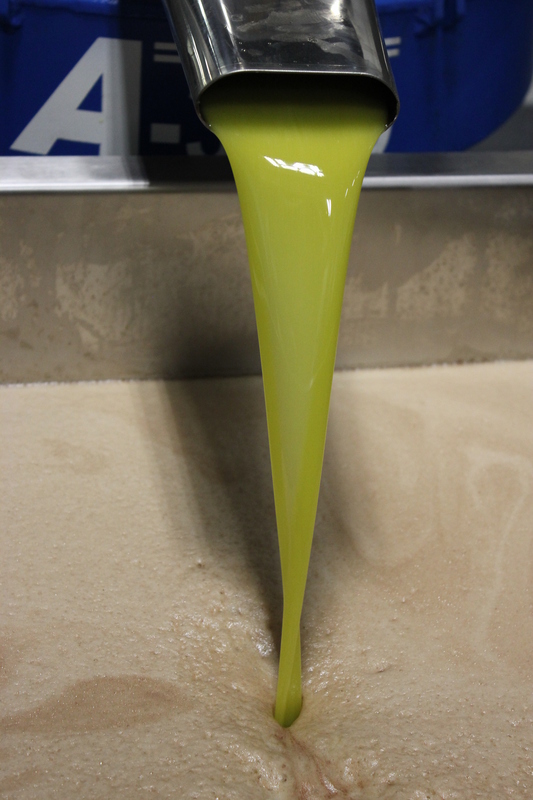 Fresh pressed olive oil flows at Boundary Bend. Photo taken by Imei Hsu. 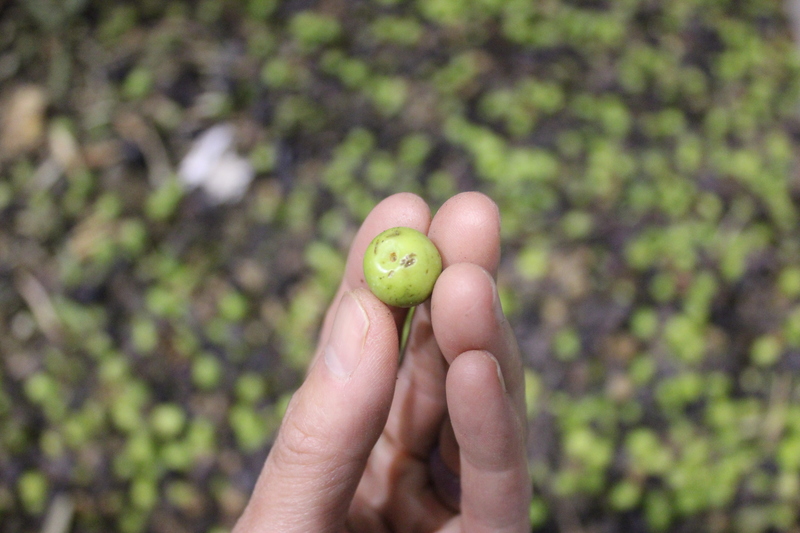 Of the fourteen varieties of olives grown at Cobram Estate, Coratina is the one you see photographed in this post; it was three weeks out from harvest. The Picual varietal is one of their best. They pick the olives when they are about “middle age” (neither young nor old), and as stated earlier, pressing them within hours of picking is what makes extra virgin olive oil tasty enough to drink it straight. Amidst the super high-density planting on the farm, the picking process uses a special machine to pick the trees during the month of October. Then they mill the fruit with a cold press process, with minimal exposure to oxygen. Inside of stainless steel tanks, they use nitrogen to protect the fruit from oxidation. The entire sorting system, conveyor area, cold process tanks, press, and bottling area takes up the entire area from the warehouse’s back door through two large rooms that are reminiscent of an airplane hanger For such a tiny fruit, it takes a lot of work to produce olive oil. EVOO should then be stored in opaque containers and used quickly. Olive oil does not stay good for months on the shelf. I suspect that if you tried to take a shot of an olive oil on your shelf that had been opened months before, you might gag when trying to drink it straight. Well, I suppose this wouldn’t be the post you were looking for if it didn’t include some mention of what you could eat or drink that contained the featured item — Extra Virgin Olive Oil. Most of us are familiar with dipping a rustic bread into a plate with olive oil and balsamic vinegar. How about corn bread with a olive oil based topper? A light and refreshing salad with an olive oil aioli, and of course, who could forget some wine with that salad? 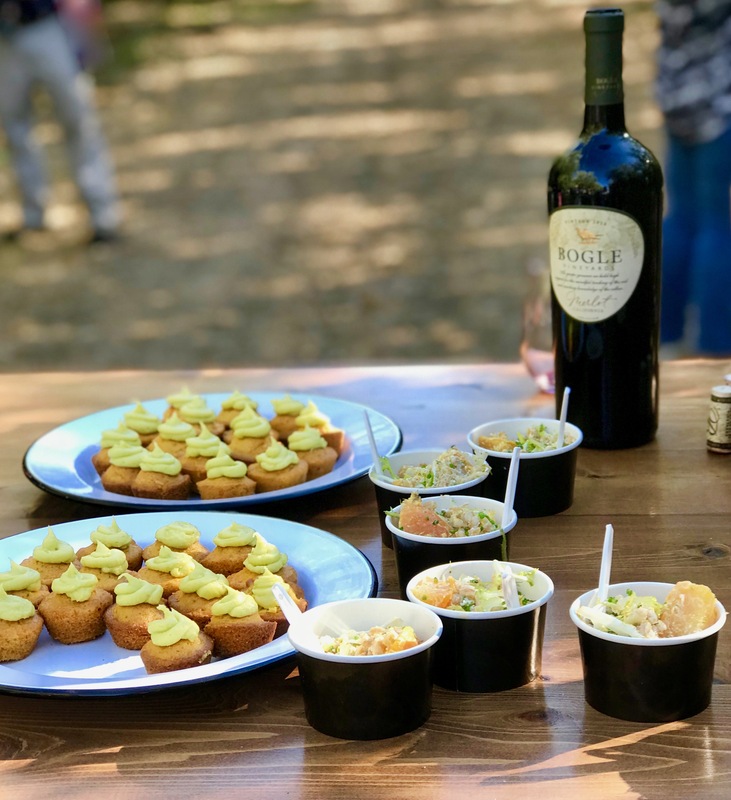 Olive oil based foods and drinks greeted us on a road in the Cobram Estate farm. Photo by Imei Hsu. As I knew it was likely that the prepared foods would contain things I could not have, I brought my own homemade gluten free flatbread, which was perfect for dipping. Chef O’Connor gave me a pour of Colbram EVOO that had pressed only two days before. This was the first time I had ever had olive oil that freshly pressed. I hope I’ve inspired you to take a look at EVOO, to be able to select a quality one, and if you want to try a Cobram Estate EVOO, to go on their website or use a store locator to purchase a bottle for yourself. I found out that my “nearest bottle” is at my local Whole Foods. Lucky me, since I am already more than half way through the bottle I was gifted with for visiting. My thanks to the International Food Blogger Conference for setting up this remarkable excursion, and to the City of Sacramento for hosting the IFBC attendees this year. 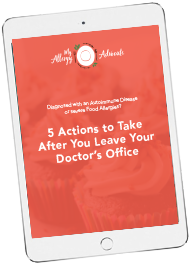 It was the perfect excursion for someone like me with food allergies and autoimmune disease, and the location was perfect. To your health, and I hope you’ll keep making food fun again right along with me.